198 July 31/13 Another from the roadtrip. 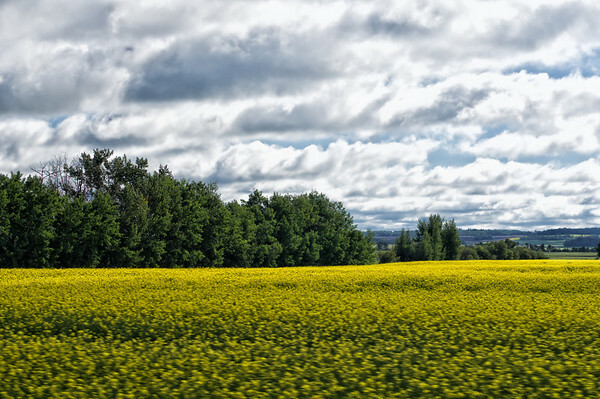 The Canola fields are in full bloom here in Alberta and this one was shot through the window from the truck as we were going down the highway. Some of you have asked where we're going, well, sometimes the journey is more interesting than the final destination. In response to what I'm sure will be the hottest topic of the day, I like the new changes at Smugmug, but I'm not happy with the changes to get rid of the communities. I don't think the powers at Smugmug really realize the close group of people around the world that belong to the dailies. Beautiful scene, love the canola field color! Beautifully captured! Wonderful depth to this lovely country scene. Beautiful colors of the field all the way to the sky! lovely colors,even with the movements. I like what I've seen of the changes at smug, not giving up hope on keeping the daily. Gorgeous. Love the pp too.